I have to say good bye, good bye to a great team and an amazing experience. 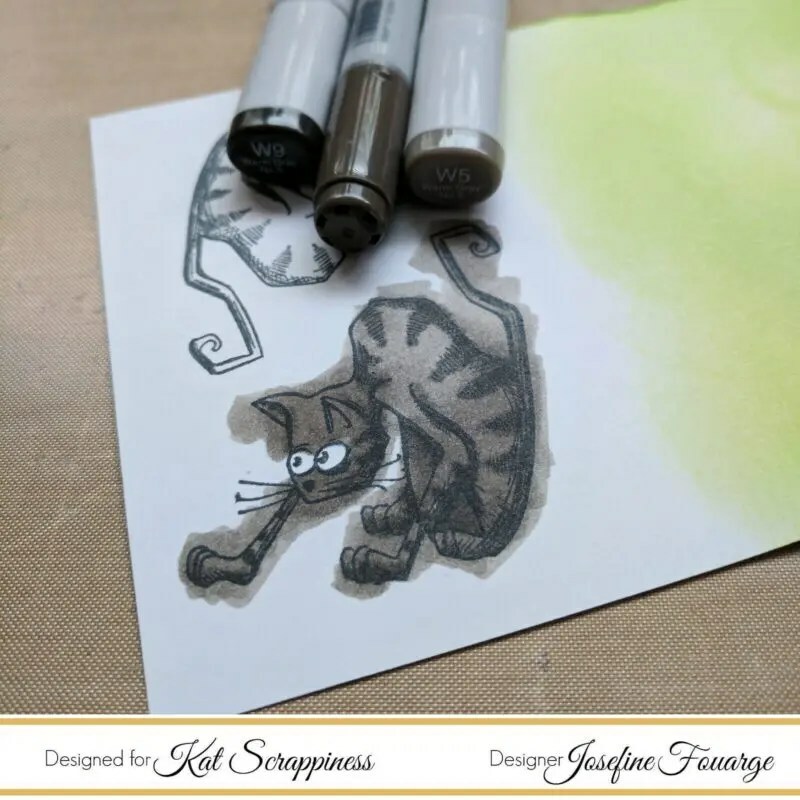 This is my last post for the Kat Scrappiness Design Team. The half year is already over. Sometimes it’s scary how fast time passes by. But I’m not gone forever. You can still follow me on my blog and stay in contact with me through social media. 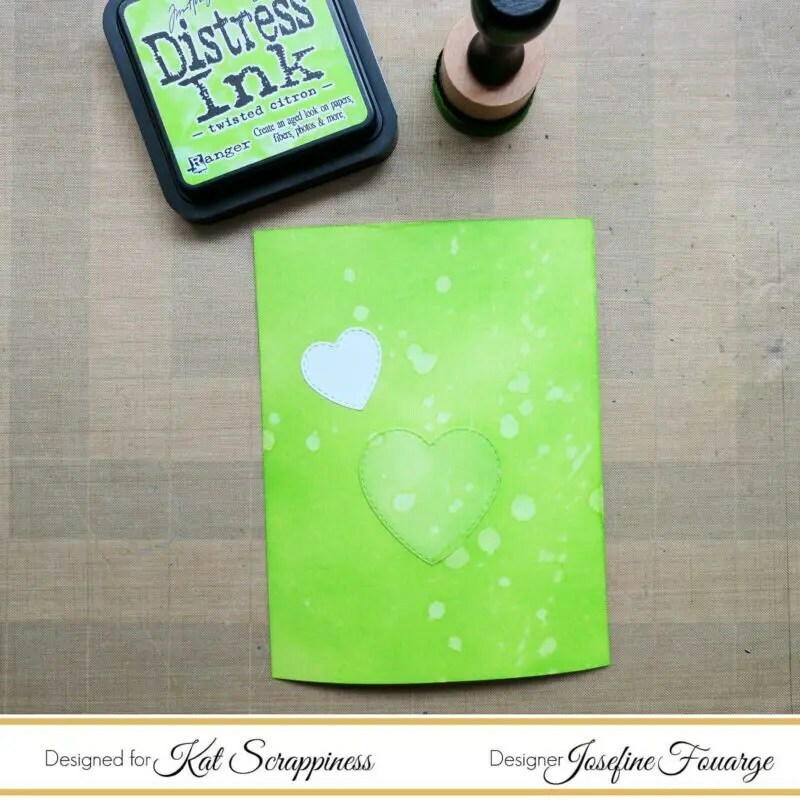 As you know I love messing around with Distress Inks, so I decided to create several layers with masked off hearts. 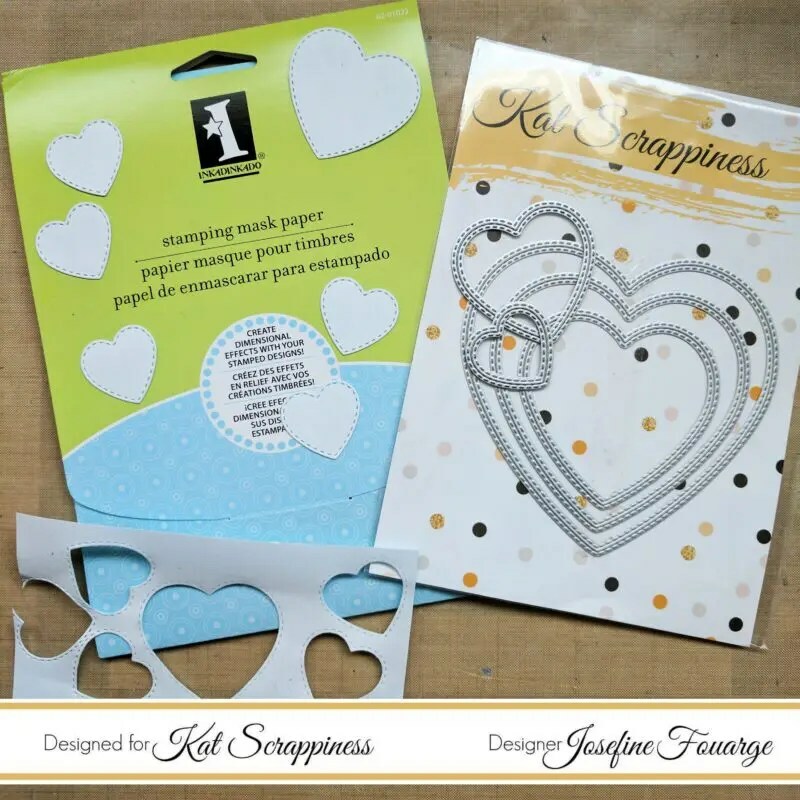 I used the two smallest heart dies to create the masks from Inkadinkado masking paper. Then I applied the first layer of ink (Twisted Citron) and placed the first mask so it sat between the sentiment and the scrappy cat. With the first mask in place, I added another layer of Twisted Citron Distress Ink and splattered a little water on top. 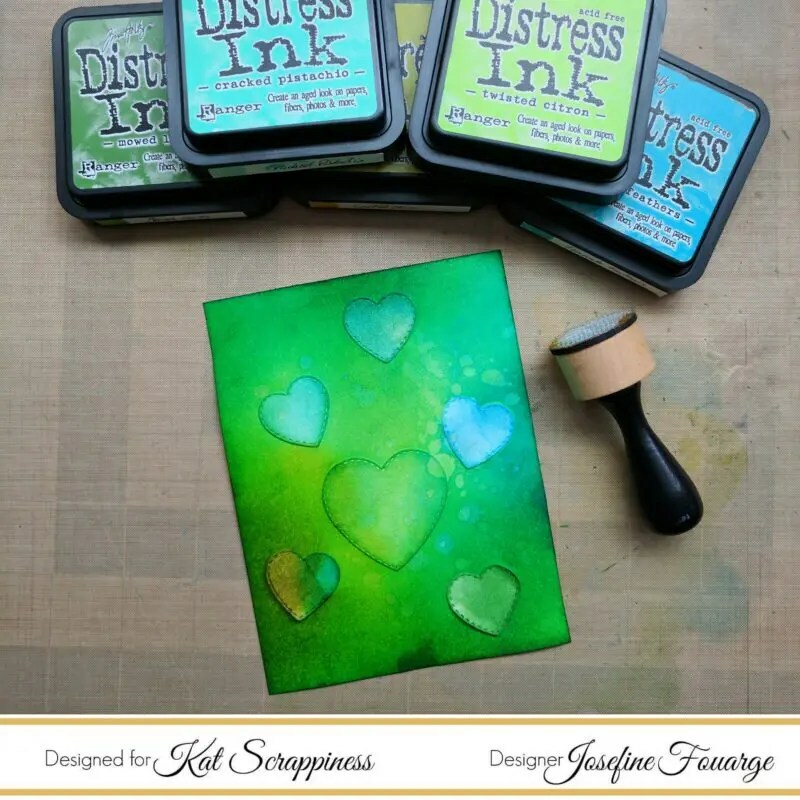 Now I switched colors and added another layer of Distress Ink on top. After every new color, I added a new mask and sometimes splattered some water on top. I finished after I added some more Cracked Pistachio, Mowed Lawn, Crushed Olive and Peacock Feathers and removed all the masks to reveal the beauty underneath. To create a pretty frame, I ran the panel through my die cut machine with the new stitched fancy scalloped rectangle die. It was time to color the scrappy cat 😛 As you can see I was very precise with coloring it. I used Copic markers in warm gray and then fuzzy cut it. 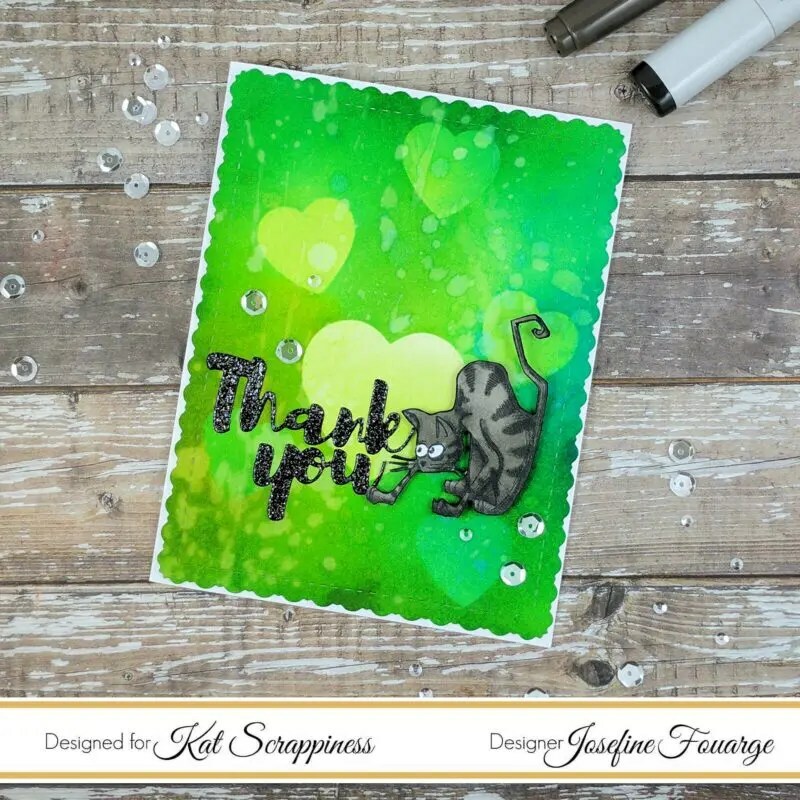 Next up, I die cut the thank you with Kat’s Thank You die and heat embossed it with black Nuvo embossing powder. 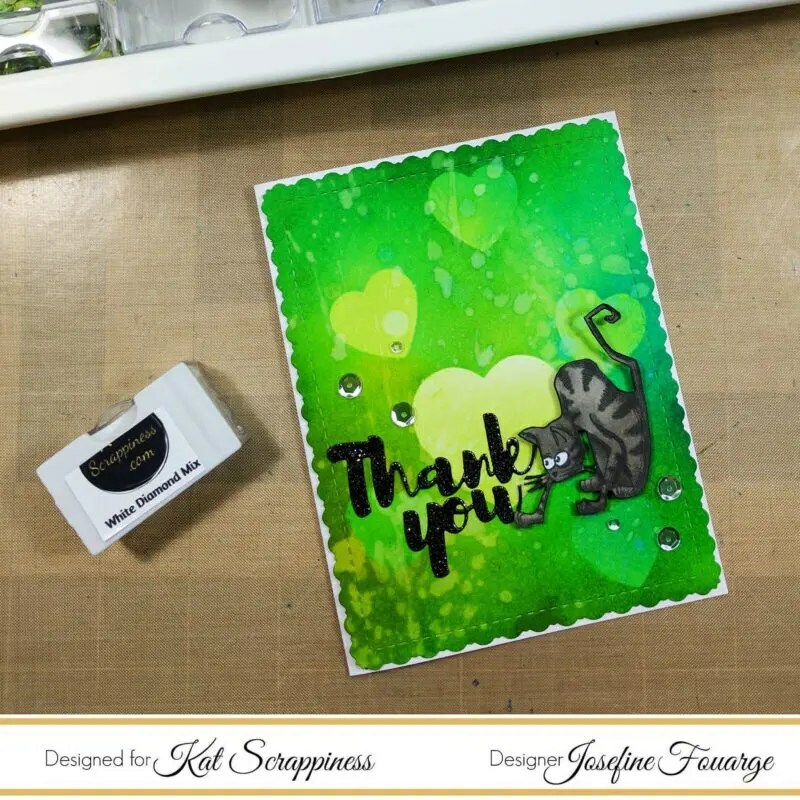 A few sequins later, I adhered the sentiment and the cat to the panel and all to the card base. Thanks for joining us. I can’t wait to see what the new design team comes up with! 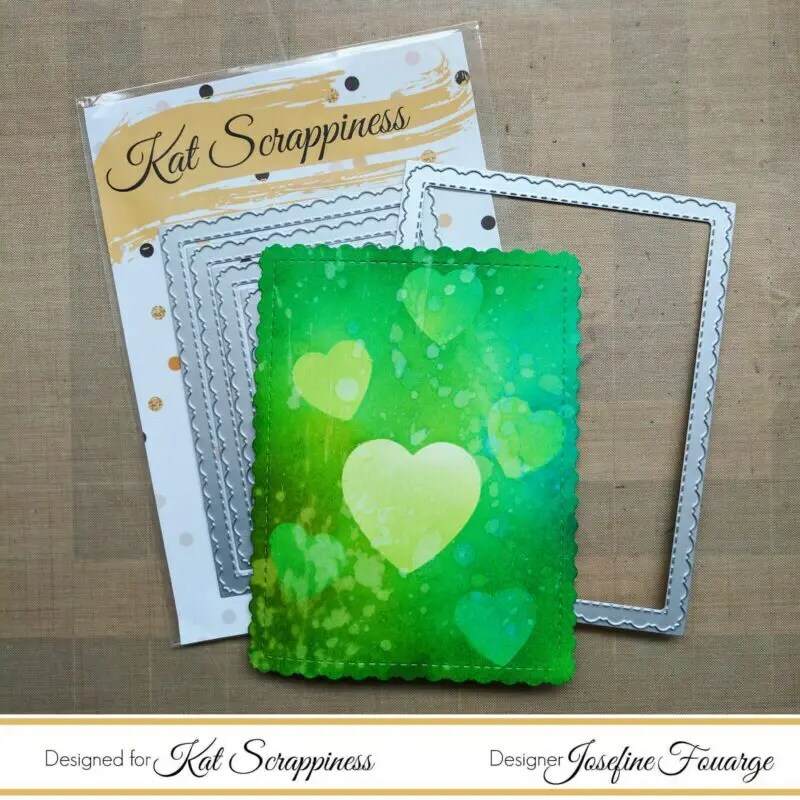 Kat Scrappiness – Stitched Fancy Scalloped Rectangle Dies by Kat Scrappiness – NEW! 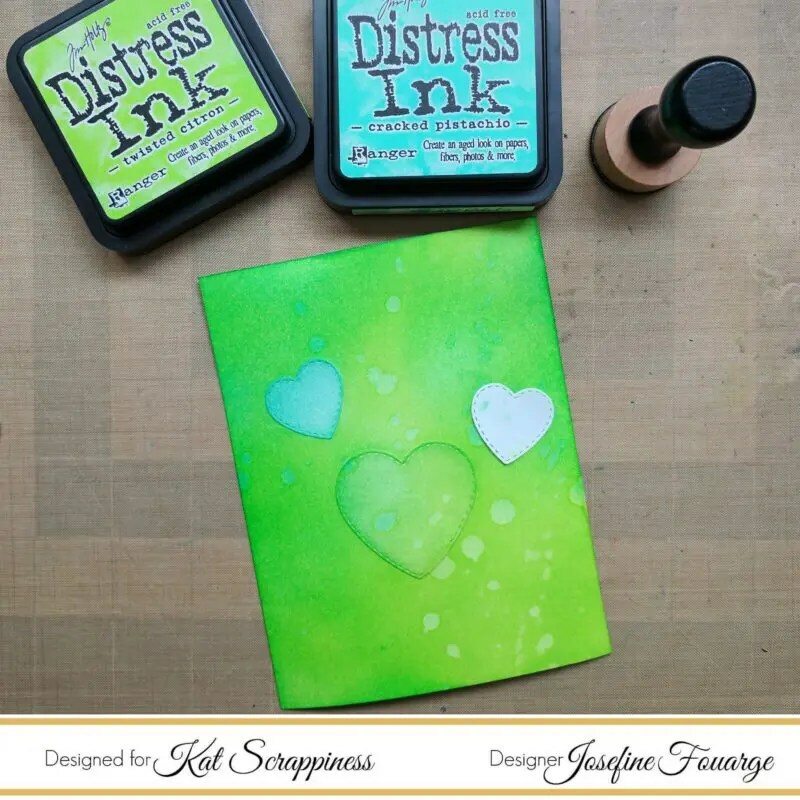 Kat Scrappiness – Double Stitched Heart Dies by Kat Scrappiness – NEW! 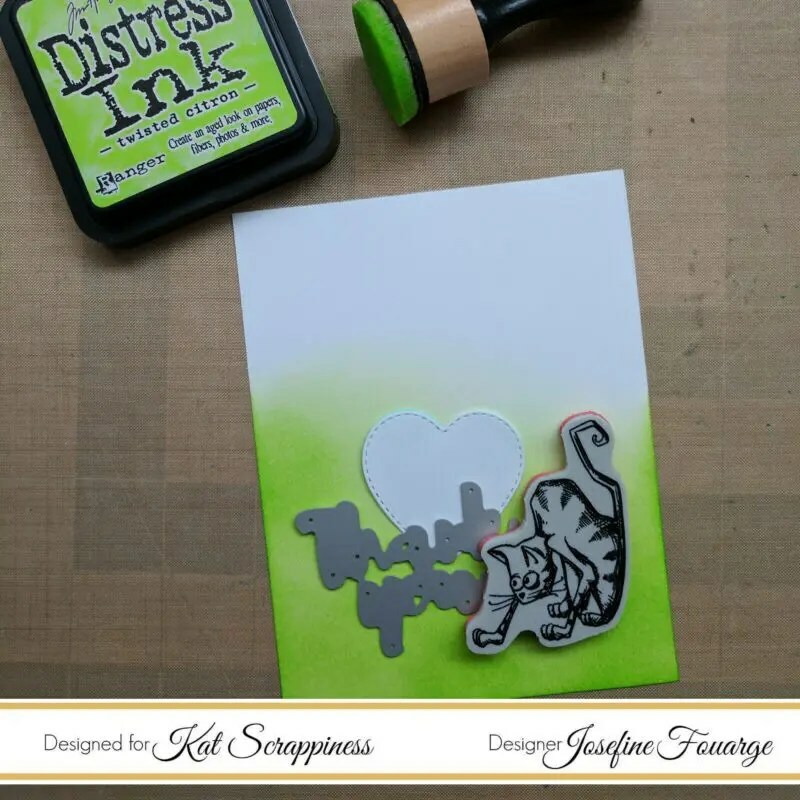 Kat Scrappiness- Tim Holtz Mini Crazy Cats and Dogs Cling Stamps – NEW!